Soon every state in this great nation will have a color. Some will be red, some blue, this is what Presidential politics brings to the country in an election year. Long before the states were sorted by color, the Department suffered through its own kind of partisan politics. The LAPD was divided into two parts, and not of equal measure. Officers lost their jobs, simply because of their political affiliations. 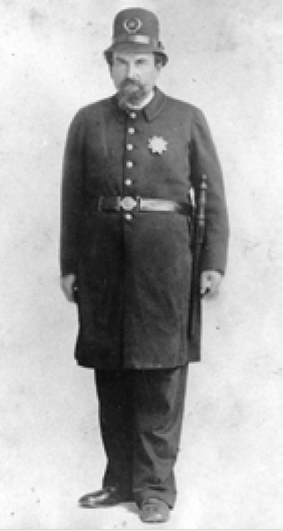 Chief John Glass is credited with being the first pioneering Chief of the LAPD. He took office in 1889 and served until 1900. During his tenure, the Department experienced a number of important changes, and grew significantly. It was during that same year, that some unusual politics shaped the force Glass would lead. Early in the year, the force grew to 100 officers, a sorely needed expansion. The force was comprised of members of both the Democratic and Republican party, affiliations of which were noted in City records. 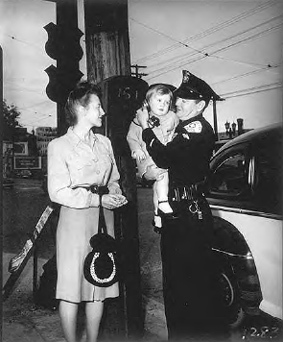 During the year, a Republican administration was elected to govern the City of Angels, and this action apparently gave birth to a concept adopted by the police commission. forth as a largely Republican enterprise. While looking at the list of replacements, one name stood out, H. W. Marden. His photo, from that same time period, rests in our archives. We are proud to share the portrait of this stern faced officer. It’s from a period when the Department had political colors, but the pictures did not. It is with a great sense of pride that we communicate the many things that have been going on here at LAPM. Of particular note is the production of our very first challenge coin. We sought to tie the rich history of the LAPD to the current LAPD, and we think we managed to do just that. Nothing is more representative of the current, or former, LAPD than the distinctive badge. Accordingly, the historical side of the coin reflects the first style worn by LAPD officers from 1869 to 1890. The flip side features the current badge. The coins are now available for sale, and a convenient order form can be found on the last page of the newsletter. We offered the coins for sale at our April 2nd private screening of LA Confidential. 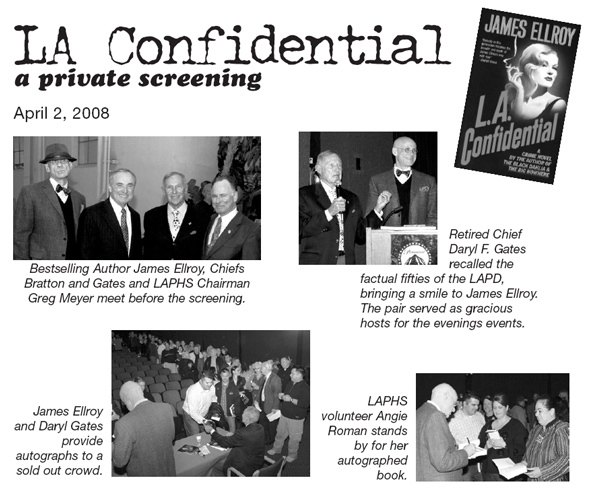 This sold-out event, hosted by bestselling author James Ellroy and retired Chief Daryl Gates, was a most enjoyable evening. Besides a host of active and retired officers, Chief William Bratton and District Attorney Steve Cooley attended. We also had visits from some other great supporters, and current Chiefs, Bob Taylor, Dan Watson and Peggy York. After the screening in the private Sherry Lansing Theater on the Paramount Studios lot, both Ellroy and Gates shared their respective versions of the fifties with all in attendance. Once the remarks concluded, both stayed to autograph copies of LA Confidential. We also managed to capture the evening in pictures on the following page. We owe our thanks to both James and Chief Gates. We have had some other brushes with VIPs early this year. Our February 20th Chief’s Circle luncheon brought out a number of loyal supporters. 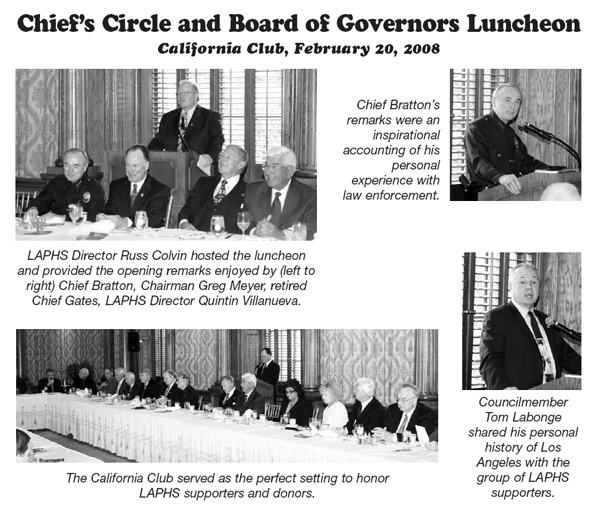 Russ Colvin, a dedicated member or the LAPM Board of Directors, hosted the luncheon at the California Club. Chief Bratton and Councilman Tom Labonge spoke about the great history of the City and its police department. A couple of notable retirees, Daryl Gates and Councilman Dennis Zine were in the crowd, and enjoyed the day’s events. We were also joined by Commissioner Alan Skobin and former Commissioner Bert Boeckmann, both of whom are deeply involved in supporting our efforts to advance the museum. Quintin Villanueva, who recently retired from the Board of Directors was officially recognized by Chairman Greg Meyer for his many years of LAPM service. The day was a fitting means of honoring those who have pledged a high level of financial support. We were honored to see everyone at a truly marvelous setting. wonderful opportunity to visit the Historical Society Museum. In collaboration with the Southwest Museum, Heritage Square, the Lummis Home, the Pasadena Museum of History and the Gamble House, we will be offering free admission, and some features unique to this event. LAPM will have roving models dressed in period uniforms to add some historical flavor to the day. We will also set-up a booking photo area where visitors can capture their own “booking photo” inside the jail. Not every museum can offer such a unique feature, we hope you can come visit. Last year more than 1,000 people stopped in, and this year’s event promises to be even better. LAPM will serve as the transportation hub again this year. This allows LAPM visitors to park here and visit the other museums via free shuttle buses. More information is available on the web at www.museumsofthearroyo.com. Besides all of these special events, we have some projects in the works. In the following pages is a description of a project related to the Department’s photo archives. They have asked us to pass along the word about their photo project, so we invite you to read on about their efforts. LAPM is also progressing with its own photo collection. Thousands of images are currently out for scanning. We may well be asking for help on our own collection in the coming months, as we continue with our own photo collection. We also have a request from an LAPM member relative to a project to honor California State Police Officer David Jack. Sgt. Jake Bushey is seeking support to have a new Federal Courthouse at First and Broadway named in honor of Officer Jack. He is asking for letters of support to be sent to Congresswoman Lucille Roybal-Allard. Officer Jack was murdered on this site in 1974, the dedication of the new building in his honor seems to be a fitting tribute. Unfortunately all of us have suffered some of our own losses recently. It is important to take some time and acknowledge the tragic loss of long-time SWAT Officer Randy Simmons. His murder impacted all of us here in the broader law enforcement community. The Historical Society extends our condolences to the Simmons family.We also send our best wishes to the Veenstra family. From outside the LAPD family, another significant loss was noted recently. The Honorary Mayor of Hollywood, Johnny Grant, passed away. His memorial service filled the Pantages Theater, a fitting place to say goodbye to a true Hollywood legend, and a great LAPD and LAPM supporter. The Los Angeles Police Department has embarked on an ambitious plan to catalog and preserve nearly one million photographic negatives accumulated during decades of police service in the city of Los Angeles. The images constitute a visual record dating primarily from the early 1920s to the late 1960s. “Our agency has a rich heritage that parallels and reflects the history of the city,” remarked Mary Grady, Public Information Director for the LAPD, whose Entertainment Trademark Unit will coordinate the undertaking. “The Department has played a vital role in every era of the city’s past. So it is fitting that these negatives should now offer a unique visual resource, one derived entirely from a law enforcement perspective. The photos are expected to be a great help to anyone wanting to learn more about Los Angeles and the LAPD. We envision the portfolio becoming an important tool for interested parties from many different backgrounds, including historians, journalists, entertainment professionals, students, private citizens, and other law enforcement agencies. “While LAPD archival photographs are and have been available in recent years (see www.FOTOTEKA.com), they represent just a fraction of the full collection of film negatives. In total, more than 960,000 photo negatives are housed at several film vaults around the city. Until now the images have remained largely forgotten and unexplored. Because of the project’s magnitude, the City has opted to outsource the task of establishing a database for digital scans of each negative. The work will involve sorting, identifying, and electronically scanning every image. The newly digitized files will then populate a database capable of accommodating queries based on any number of search criteria. This spring the City will announce a formal Request for Proposal (RFP) for companies wishing to be considered for the project. Including the bid phase, the full venture is expected to last several years. each photograph. “Our retired officers are a tremendous asset. We want to tap into their memories and employ their expertise as much as possible,” said Grady. While all of the images will be subject to existing copyright restrictions, with ownership retained by the City, the photographs will be licensed for use. “We want the pictures to be utilized in ways that maximize their benefit to the most number of people,” Grady stated.